I've had to get a little creative around here lately as Luke's strong aversion to time-outs has started to wane. Thus we introduced a little positive behavior support via sticker chart, to much success. His reward? A trip to Frederik Meijer Gardens. The weather was looking promising today, and as this is my week to host our friends' child care swap, I offered to take Logan and Ian with us for the day. I was slightly apprehensive about touring a crowded park with three toddlers and an infant in tow, but really the hardest part of the whole day was installing all of the car seats into our car! 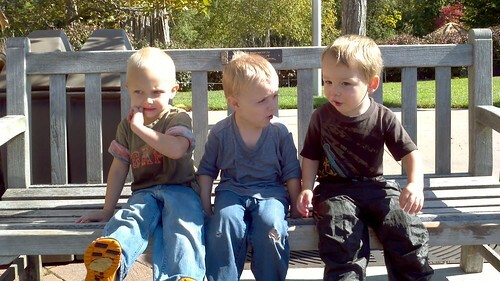 Once we got to the Gardens, we had a blast. "Wow ma'am, you have triplets AND a baby??" 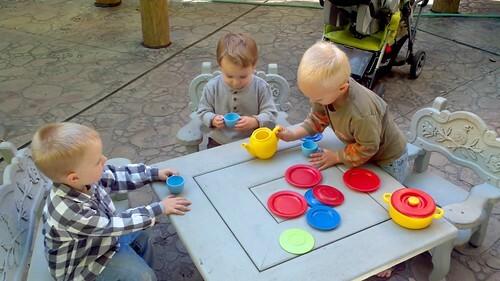 Tea time: its not just for girls anymore. Luke's favorite activity is the boats in the Great Lakes, so I always save that for last. 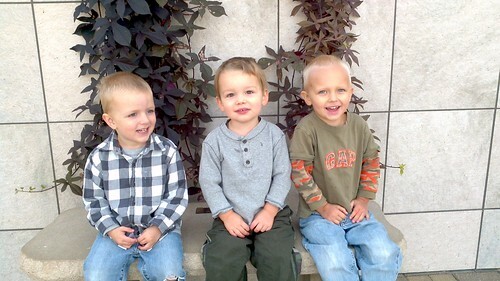 And good thing I did - look at these three soaked boys! 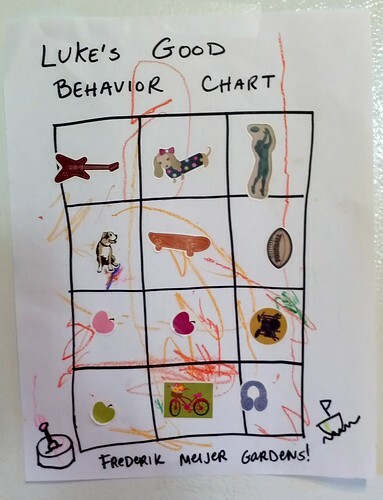 While we've started another sticker chart for Luke, I'm thinking I might need to change the reward. I don't think we've got many warm days left this year. So long, FMG children's park, and thanks for a great summer!